Spend a day 'in the wild' with Safari World's exotic animals and enjoy the zoo's lunch buffet! Check out specific attractions and tour at your own pace with this tour's customizable itinerary! Dine buffet-style for free at Safari World's zoo and get to try multiple dishes all at once! It was a great experience and even though we only got to two place, we were able to maximize it especially the safari tour. Safari Tour: You will ride the same van that take you there to watch the animals live in the safari. They have various animals such as tigers, lions, deers,rhinos, giraffe etc. The driver will drop you and you are on your own. There are schedules of the shows and we are able to watch 5 shows in total. Spywar was our favorite. If you have extra cash, opt for giraffe feeding (100 baht) and baby tiger picture/feeding (700 baht). The buffet is ok, they offer like 5-6 dishes, a noddle bar and an icecream bar. Chocolate Ville: Place is small and you will be going there around 5pm, food is reasonable compare the restaurants in Bangkok. (Pizza is around 200 baht good for 2) This is a place to get those Instagram pictures because the place offers a lot of picture taking opps. Bring the whole family for a day of adventure at Safari World and Chocolate Ville! Get your money's worth when you tour both these fantastic attractions in one day. Jumpstart your family getaway with a trip to Safari World, and take the kids to the spectacular attractions and shows inside. Introduce the whole family to exotic animals like snakes, hippopotamuses, racoons, and a whole lot of others! Head on to Safari Marine Park, and feel the kids' excitement as they witness majestic sea creatures in real time! After a fun-filled morning, proceed to the zoo for a free lunch buffet. 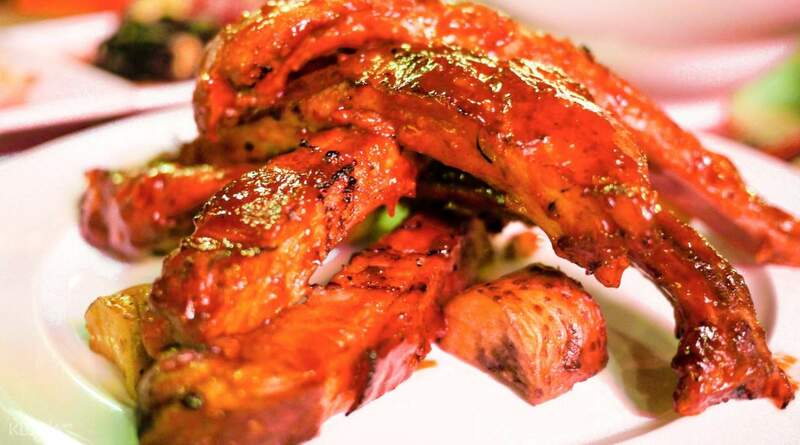 Enjoy authentic local food and stuff yourself with the countless meals prepared. 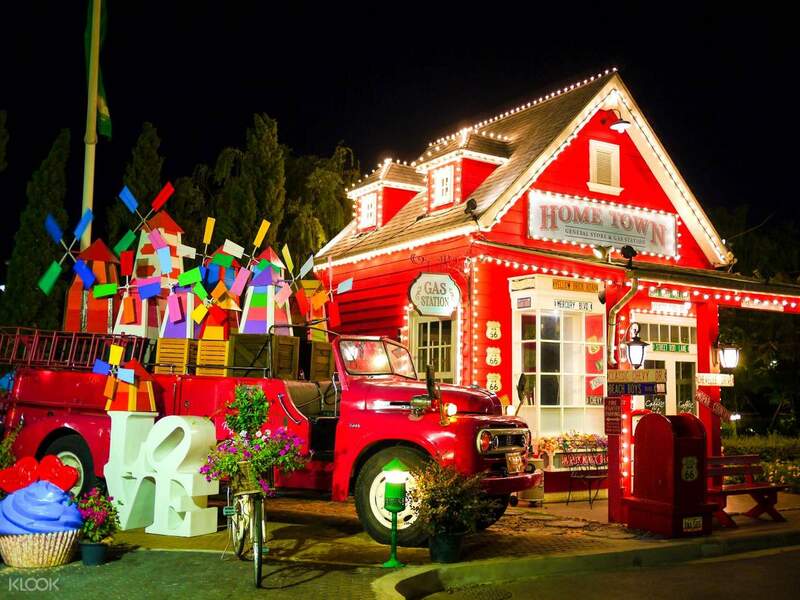 Once you're done dining, drop by the picturesque Chocolate Ville. Walk along this European-inspired complex and dine at your own expense. Be mesmerized by the restaurant's luxurious interiors and taste satisfaction as you sample their delicious meal courses. End the trip with a fun family photo session as the sun sets romantically in the background. 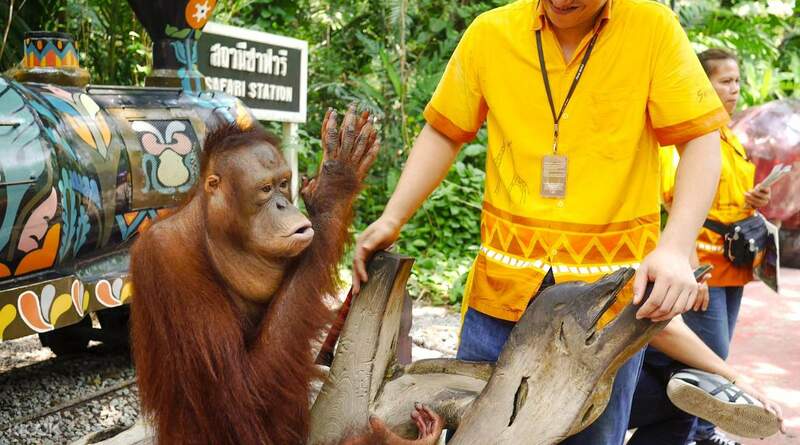 See Thailand's most talented creatures at Safari World's zoo, where elephants can paint beautiful pictures! 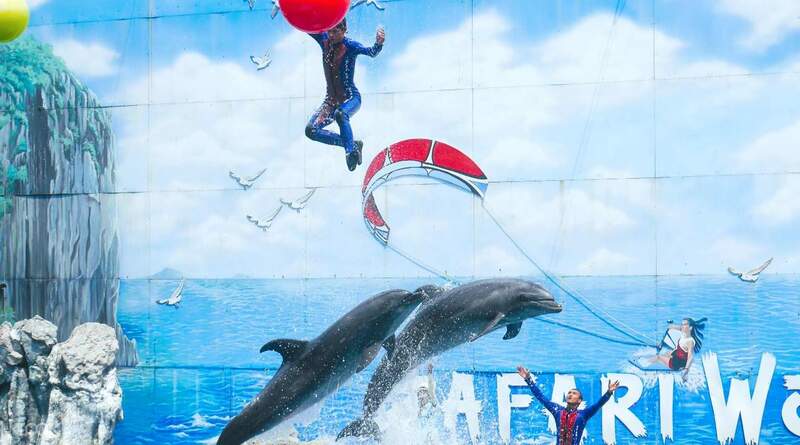 Don't miss the spectacular performances of aquatic animals at Safari Marine Park! Explore the European side of Thailand at Chocolate Ville - a luxurious restaurant complex perfect for the family! It was a great experience and even though we only got to two place, we were able to maximize it especially the safari tour. Safari Tour: You will ride the same van that take you there to watch the animals live in the safari. They have various animals such as tigers, lions, deers,rhinos, giraffe etc. The driver will drop you and you are on your own. There are schedules of the shows and we are able to watch 5 shows in total. Spywar was our favorite. If you have extra cash, opt for giraffe feeding (100 baht) and baby tiger picture/feeding (700 baht). The buffet is ok, they offer like 5-6 dishes, a noddle bar and an icecream bar. Chocolate Ville: Place is small and you will be going there around 5pm, food is reasonable compare the restaurants in Bangkok. (Pizza is around 200 baht good for 2) This is a place to get those Instagram pictures because the place offers a lot of picture taking opps. It was a great experience and even though we only got to two place, we were able to maximize it especially the safari tour. Safari Tour: You will ride the same van that take you there to watch the animals live in the safari. They have various animals such as tigers, lions, deers,rhinos, giraffe etc. The driver will drop you and you are on your own. There are schedules of the shows and we are able to watch 5 shows in total. Spywar was our favorite. If you have extra cash, opt for giraffe feeding (100 baht) and baby tiger picture/feeding (700 baht). The buffet is ok, they offer like 5-6 dishes, a noddle bar and an icecream bar. Chocolate Ville: Place is small and you will be going there around 5pm, food is reasonable compare the restaurants in Bangkok. (Pizza is around 200 baht good for 2) This is a place to get those Instagram pictures because the place offers a lot of picture taking opps. The adveture was great. I saw different kinds of animals and ofcourse the different animal shows. Also the Chocolate velle I felt that I'm in the America because of the houses and lights. Thanks! The adveture was great. I saw different kinds of animals and ofcourse the different animal shows. Also the Chocolate velle I felt that I'm in the America because of the houses and lights. Thanks! Safari world is an excellent outing with family as it has numerous shows like dolphin show, orang utan show, etc. chocolate ville is a very picturesque place and has lots of restaurants. Safari world is an excellent outing with family as it has numerous shows like dolphin show, orang utan show, etc. chocolate ville is a very picturesque place and has lots of restaurants. Meet up: We walked right pass the meeting area without realising as we thought there would be orange KLOOK signs or that the personnels would be wearing orange. However they were wering yellow vests which did not caught our eyes. But we were able to locate the meeting area afterwards. Minivan ride: We were lucky that we got the whole minivan to ourselves (we only had 3 pax). So it feels like a chartered minivan. Overall the ride was smooth. When we reached the safari, we waited quite a while for the driver to get the stickers and lunch buffet ticket. However, we were in time for the lion and tiger feeding which starts at 10:00. The driver also showed us the way for the first few shows in the safari up till lunch time whereby he brought us to the restaurant for the buffet. He was not well versed in English, thus, we had slight difficulty in communication so he used google translate to communicate with us. Safari world: The animal shows was nice, but we did not really like the cowboy show and spy war show. 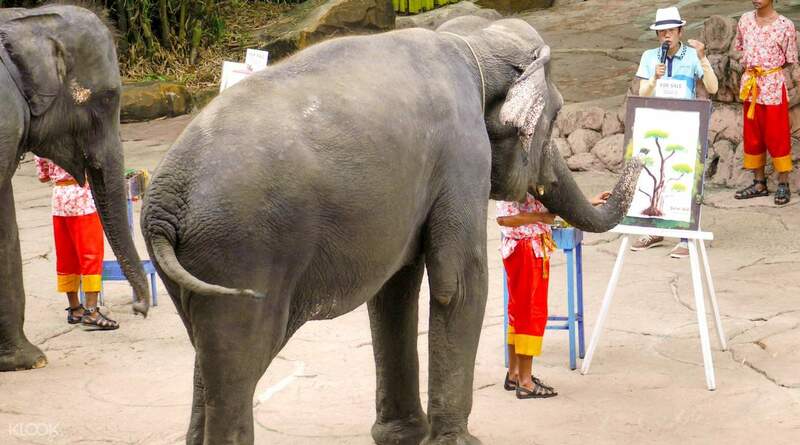 After the elephant show, we were able to have the chance to feed the elephants with sugarcane (100baht per bucket). It was a great experience. There was also a giraffe feeding area where we were able to feed the giraffes with bananas (also 100baht per bucket). It was challenging to feed the smaller giraffes as the bigger ones could stretch out their heads further. We left the safari at ~16:00. Chocolate ville: The recommended time to spend here is around an hour, as it was small. We reached at 16:30, and the driver told us to meet him at 17:30 for our journey back to the city centre. But we requested a slightly longer time just in case, so the meeting time was changed to 18:00. Since the place was small, we only took about an hour to finish walking around the place while taking some photos. The night view would be different when the lights are switched on, but we did not wait until night time since we were tired. We left the place at 17:45 and requested the driver to drop us off at Platinum Fashion Mall, and he was okay with it. Overall this was a great experience! Meet up: We walked right pass the meeting area without realising as we thought there would be orange KLOOK signs or that the personnels would be wearing orange. However they were wering yellow vests which did not caught our eyes. But we were able to locate the meeting area afterwards. Minivan ride: We were lucky that we got the whole minivan to ourselves (we only had 3 pax). So it feels like a chartered minivan. Overall the ride was smooth. When we reached the safari, we waited quite a while for the driver to get the stickers and lunch buffet ticket. However, we were in time for the lion and tiger feeding which starts at 10:00. The driver also showed us the way for the first few shows in the safari up till lunch time whereby he brought us to the restaurant for the buffet. He was not well versed in English, thus, we had slight difficulty in communication so he used google translate to communicate with us. Safari world: The animal shows was nice, but we did not really like the cowboy show and spy war show. After the elephant show, we were able to have the chance to feed the elephants with sugarcane (100baht per bucket). It was a great experience. There was also a giraffe feeding area where we were able to feed the giraffes with bananas (also 100baht per bucket). It was challenging to feed the smaller giraffes as the bigger ones could stretch out their heads further. We left the safari at ~16:00. Chocolate ville: The recommended time to spend here is around an hour, as it was small. We reached at 16:30, and the driver told us to meet him at 17:30 for our journey back to the city centre. But we requested a slightly longer time just in case, so the meeting time was changed to 18:00. Since the place was small, we only took about an hour to finish walking around the place while taking some photos. The night view would be different when the lights are switched on, but we did not wait until night time since we were tired. We left the place at 17:45 and requested the driver to drop us off at Platinum Fashion Mall, and he was okay with it. Overall this was a great experience! We arrived at the Safari World on time! Was able to see the feeding of tiger! The buffet was good too! Driver was kind and dropped us off at our hotel. We arrived at the Safari World on time! Was able to see the feeding of tiger! The buffet was good too! Driver was kind and dropped us off at our hotel. good for a good family time together. Will book from AK again. good for a good family time together. Will book from AK again. Meet up and pick up was smooth and easy. Driver was in time for tiger feeding. He also showed us the way to the restaurant where the buffet would be held. However, perhaps he could have taken note of the time of the last show for the day and asked us to meet earlier since we were all tired out by mid afternoon due to the hot sun. (Last show was 2.45 but meeting time was 4.30). We reached ahead of time to Chocolate Ville at 430. We were given 2 hours there which was more than sufficient. Ride back was smooth with a bit of jam and driver was accommodating and ready for us even when we came back earlier to rest on the car. Overall trip was good and worth it! Meet up and pick up was smooth and easy. Driver was in time for tiger feeding. He also showed us the way to the restaurant where the buffet would be held. However, perhaps he could have taken note of the time of the last show for the day and asked us to meet earlier since we were all tired out by mid afternoon due to the hot sun. (Last show was 2.45 but meeting time was 4.30). We reached ahead of time to Chocolate Ville at 430. We were given 2 hours there which was more than sufficient. Ride back was smooth with a bit of jam and driver was accommodating and ready for us even when we came back earlier to rest on the car. Overall trip was good and worth it! Easy meet up and driver is friendly. Mini van is clean and air con is cold enough. Easy meet up and driver is friendly. Mini van is clean and air con is cold enough.